Help Us Fight Cancer -- NOW: Lions and Tigers and Bears...Oh My? Lions and Tigers and Bears...Oh My? Well...not exactly. But here in South Carolina -- on vacation -- cycling life certainly can throw you a few curves. 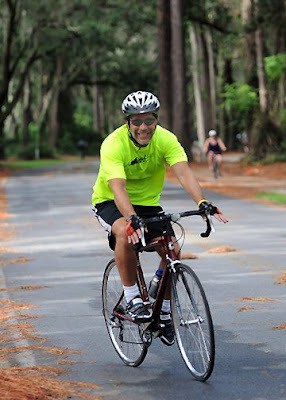 Biking across Hilton Head Island can be...interesting. 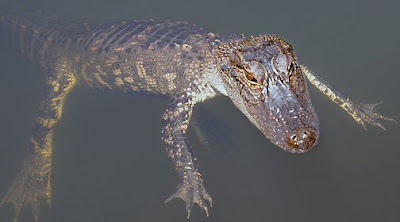 I haven't seen lions or tigers or bears...but how about alligators and snakes and millipedes the size of Cuban cigars? This gator is only about four feet long, but trust me -- with your legs hanging off the dock, that's just big enough to make you think twice about what he might be capable of if he swam close enough to use your toes for a mid-morning snack. CHOMP. CHOMP. I imagine it might be difficult to bike...with no feet. First and foremost -- rides have to be scheduled early in the morning. Why? Well...at this latitude, they define "heat" in ways very different from the definition we're accustomed to in northeastern Ohio. If you try and do anything other than dive into the cool ocean waves or float lazily in the pool after about 10am -- you're DOOMED. Want a third-degree sunburn? You'll get it - in 15 minutes, at 10:30am - on Hilton Head. Want to lose 15 pounds, and take your second shower of the day? Walk two blocks at two o'clock in the afternoon. The simple rule? Hit the road by 7am. Any later and you'll be forced to slather on aloe 24/7. Next -- keep your eyes OPEN. The golf courses that line Rt. 278 on the island are famous for really bad golfers...and alligators sunning themselves on the fairways. I pass numerous courses on a morning ride, and I'm not sure which I fear more -- some middle-aged vacationer shouting "fore!" as a dimpled white ball of DEATH cuts through the air toward me, or a 12-foot gator looking to share the chocolate chip Clif bar in my saddle bag. Both have the potential for being deadly. Take time to take it all in. One morning I turned down Union Cemetery Road off Rt. 278, and guess what I came across? 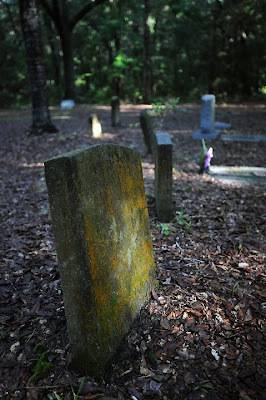 You guessed it -- a Union cemetery from the Civil War. Despite my constant desire to push hard and fast on the bike, I pulled off the road, unclipped from the bike and walked through the site for a short while. The sunshine rose through the trees and the abundant Spanish moss...grave markers were so old that the writing on them had faded to nothing...I reviewed references to battles I never learned about in history class...there were flowers recently placed on grave sites for individuals who had died over 120 years ago -- it was quite an education, and a great find after missing it for the past 23 years of summer visits to the island. Ride early -- not only because of the heat, but because you need to avoid the tourists. These folks are twice as dangerous as the the gators. I tend to ride the bike paths at about 18-20 mph...and the tourists (who, apparently, haven't been on bikes in over two DECADES) travel at about 2 mph. You do the math -- you catch them quickly. Beware of sticks on the bike path early in the morning. Why? Because most of the "sticks" are "snakes." I guess humans aren't the only one who enjoy laying out in the beautiful South Carolina sunshine. Close your eyes and picture a Chicago "el" train. Now shrink it down and you have the basic shape and movement of the large gray millipedes that like cutting in front of you on a ride. No big deal, right? Well, it is, actually. I noticed they tend to "pop" when you run over them. Disgusting, huh? Squished Hilton Head millipedes are the equivalent of an oil slick on a wet road in northeastern Ohio. Brake at the wrong time...and you're kissing pavement.